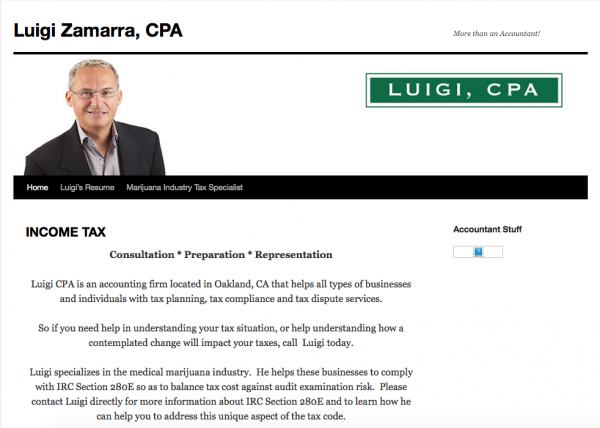 Luigi CPA is an accounting firm located in Oakland, CA that helps all types of businesses and individuals with tax planning, tax compliance and tax dispute services. So if you need help in understanding your tax situation, or help understanding how a contemplated change will impact your taxes, call Luigi today. Luigi specializes in the medical marijuana industry. He helps these businesses to comply with IRC Section 280E so as to balance tax cost against audit examination risk. Please contact Luigi directly for more information about IRC Section 280E and to learn how he can help you to address this unique aspect of the tax code.